Punjab Police beaten the ‘Dumb’ for bribe: Ludhiana. 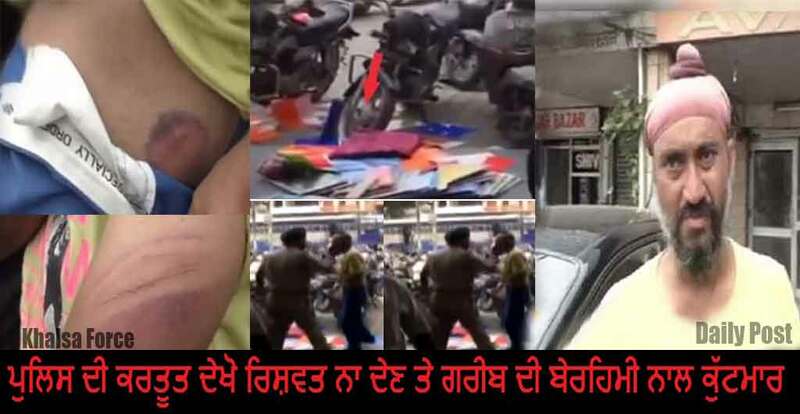 The Punjab Police employees beaten the file cover seller due to not given money to them, Outside the Passport Office located in Ludhiana. The police employees have beaten up the poor man by tore up his uniform. Physically dumb, Gurdeep Singh sells cover of files near the passport office to fulfill his family needs. Gurdeep Singh mentioned that when he refused to give money to the police employees, he scattered all of my files and beat me up. Gurdeep Singh says many other people work near the passport office to sell files covers. But on Monday, he refused to give money, after which the policeman beaten him. The police officers were captured in camera while beating Gurdeep Singh. These pictures are showcase of working of Police Commissioner Ludhiana. Previous post The Blue Whale Suicide Game ? | Important Information for Parents !